Introduce the latest breakthrough in cancer therapy – YOU! Cancer continues to be one of the leading causes of death around the world, and we are far away from finding the real cure for various cancers at the moment. 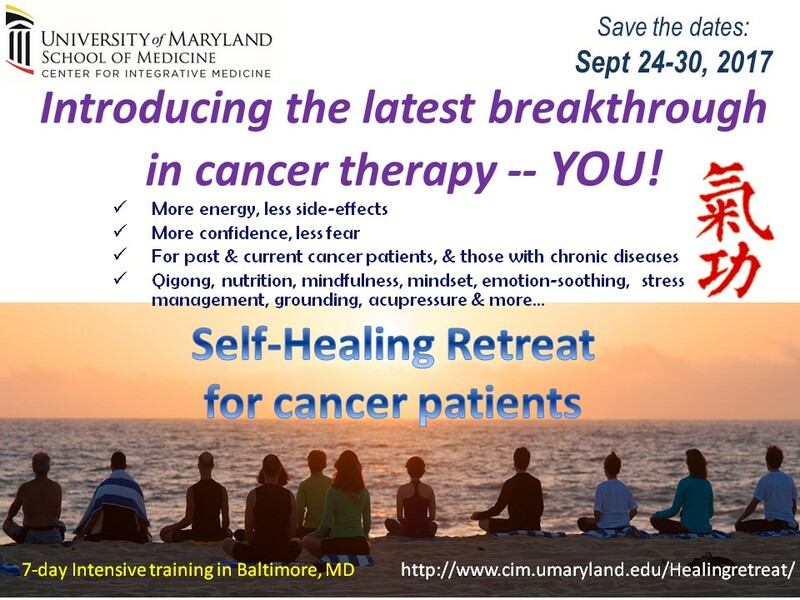 The self-healing retreat in University of Maryland Baltimore is introducing the latest breakthrough in cancer therapy – YOU (the patient’s self-care and self-empowerment)! Because all known effective therapies work closely with patients’ immune and self-recovery system; and real sense of health or recovery is not simply absence of physical diseases (cancer in this case), but also a full emotional, mental and social health. Most current cancer treatments focus on the cancer itself, or how to remove or reduce tumors, but little has done on the internal environment that cultivated cancer growth in the first place, such as the stress and anxiety, cancer-phobia, emotional disturbance, relationship issues, life-style, nutrition, and purpose in life, etc. which may lead to cancer growth or recurrence. These non-medical factors are highly correlated with treatment failures and cancer recurrence, but have not seriously been treated in conventional cancer treatment. 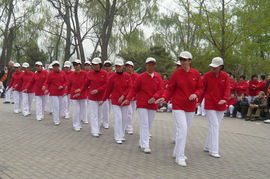 Here is where Medical Qigong from traditional Chinese medicine can play an important role. The Qigong-based self-healing program offers a different philosophy and method in treatment of disease or sickness like cancer. 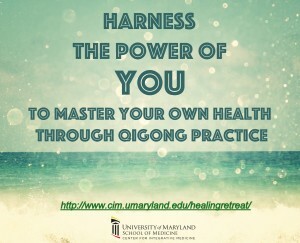 To help people understand what has been offered in University of Maryland Baltimore that are significantly different from other existing cancer treatment programs, I would like to outline the highlights of our Qigong-based self-healing program that is designed not only to help build the strength and energy needed for healing and recovery, but also improve the internal environment that cultivated cancer growth (such as stress, emotional disturbance, relationship, life-style and nutrition), and offer real sense of complete health and recovery while complementary to existing therapies. The first task in our retreat is to get rid of cancer-phobia, and turn traditional searching for help outside to searching for help within so as to rebuild confidence in recovery. Cancer is not your enemy, but an alert to you that your internal environment and life-style was suitable for cancer growth! It is the cells crying for help! It is the immune function and self-healing power that eventually survive and cure the cancer. The effects of cancer-phobia are the true form of an incurable disease, since they keep the patient stressed out and weakens the immune system. Everyone possesses great potential of self-recovery and self-healing, we need revealing its power for our recovery so as to achieve true health and recovery! Stress is not what happens to us, but how we respond to what happens. Even in the face of difficult situations, we can choose how to respond. Rather than being carried away by stress and fear, learning effective mind-body stress and anxiety management techniques can improve well-being, increase optimism and decrease worry. 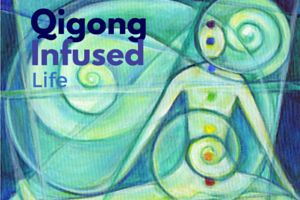 In this unique retreat participant will learn powerful mindfulness and breathing techniques, develop skills in acceptance, let-go and positive reframing, practice non-judgmental detachment and experience Qigong movements that have been specially designed to enhance relaxation and general wellness. Be mindful of your body/spirit, understanding mind-body connection, body can be used to facilitate stress reduction, filling up your “cup”. Creating a positive, present and detached mindset – exercises and resources designed to facilitate a customized positive present mindset. Stress-free and anxiety-free is the foundation of cancer recovery! I have been trained in cancer-fighting Qigong techniques with the well-known qigong teachers and masters, and will teach and share the unique and important knowledge with retreat participants. Although Qigong is well-known for health and healing, not all Qigong schools are willing to openly challenge cancer (due to the high mortality rate and complication during retreatment). 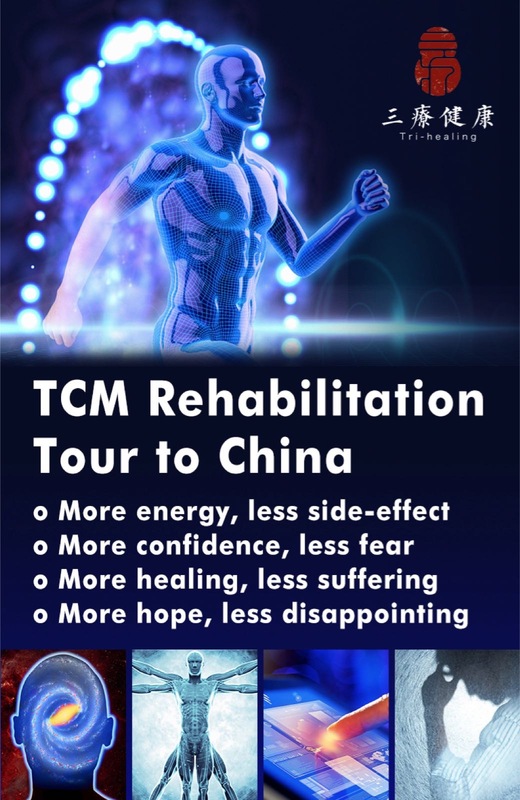 Two medical qigong forms stand out in the past 30 years — the Taiji Five-Element Self-Recovery System and the Guolin New Qigong, both claim they are good therapy for cancer healing and recovery with thousand documented successful cases. 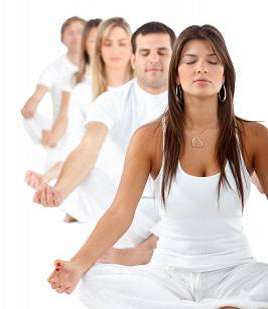 Qigong practice can rapidly rebuild immune & healing system, complementary to existing therapies. 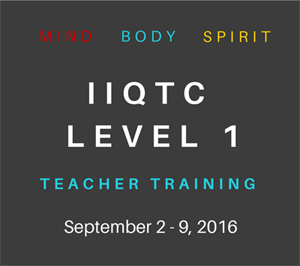 Students learn both forms of Qigong and will leave the program with the skills to continue Qigong practice on their own once returning home. The self-healing program does not target at cancer per se, but the environment or life process that is vulnerable to cancer growth and produced cancer in the first place. 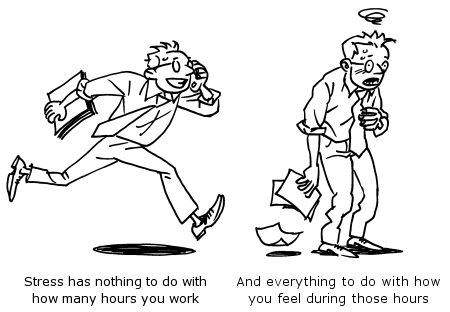 We all have behavioral patterns that do not support our wellness. This Self-Healing Program will help participant identify these patterns or elements, and provide techniques to help them overcome them. We frame the cancer experience as a ‘urgent alert’ from life, we must learn to identify health-inducing changes in lifestyle, thinking patterns, habits and behaviors that are needed to regain the healthy integration of your mind, body and spirit. 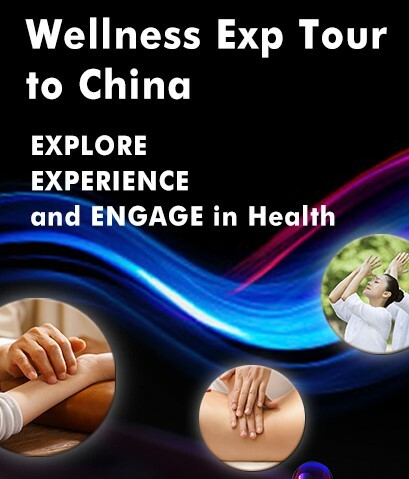 In short, the Qigong-based self-healing Retreat for cancer recovery has applied some key self-healing techniques from Qigong therapy and other existing knowledge for a complete recovery with two major emphasis: Build a positive & present mindset (attitude change) and boost energy and self-healing potential through qigong practice. “Transformational and giving hope… a method to continue my recovery with commitment and focus on Qigong”. 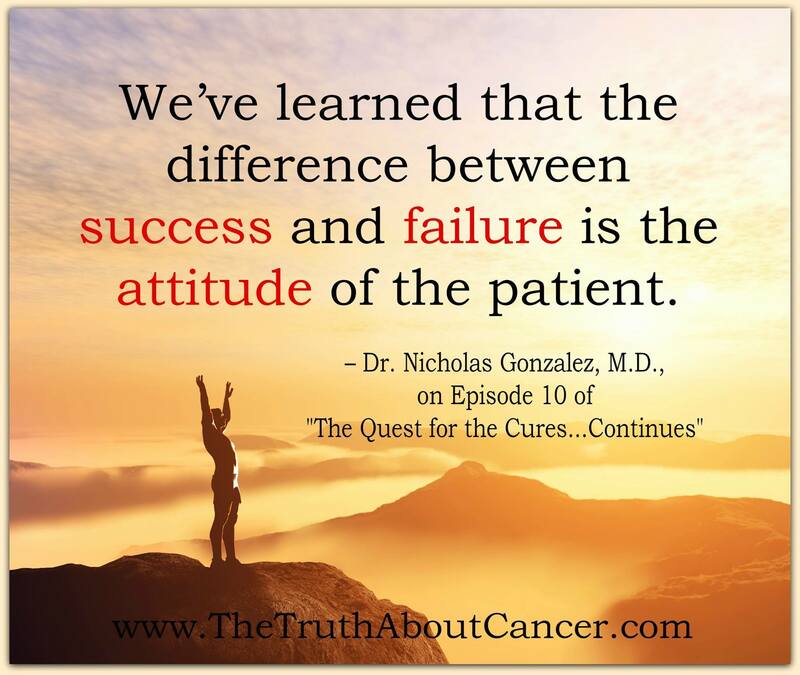 “This is truly a unique opportunity for people with cancer to learn how to develop a positive and constructive attitude about cancer. 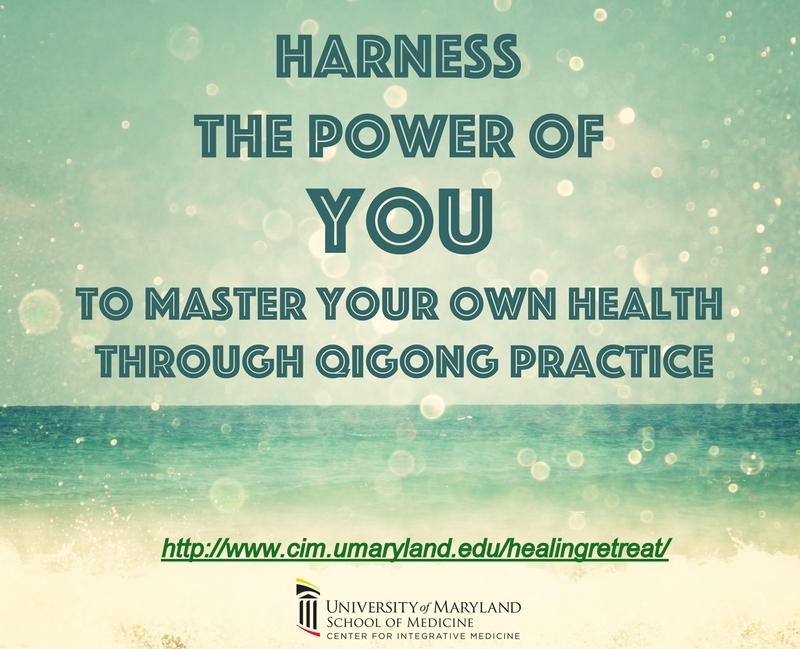 This retreat teaches one to have trust in his ability to develop and master his own approach to healing through the unique qigong practice. It is an uplifting and confidence-building experience. This entry was posted in Method of Self-Healing, Uncategorized. Bookmark the permalink.